These posters are part of a set of recruitment posters issue by the Parliamentary Recruiting Committee (PRC). The PRC was set up following the outbreak of war in August 1914. This was a cross-party organisation chaired by the Prime Minister, Herbert Asquith. It utilised the party infrastructure in parliamentary constituencies to support recruitment – party activists were called upon to distribute leaflets, and organise rallies, processions and public meetings. The PRC commissioned some 200 posters, mostly published before the introduction of conscription in January 1916. 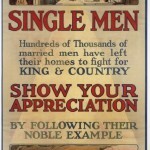 I find it interesting how some of the posters were so psychologically manipulative in their attempts to encourage men to sign up, whilst lacking in subtlety. 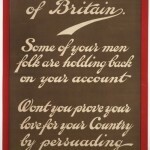 They tried to provoke a sense of guilt, targeting single men by citing the bravery of fathers and husbands who had already enlisted, or fathers through the imagery of children. 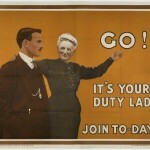 Some posters were aimed specifically at women to persuade their husbands and sons to enlist. 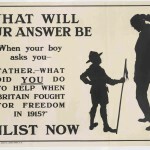 More of our First World War recruitment and fundraising posters can be seen on our Serving Soldier website. 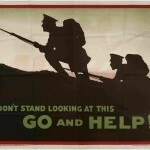 This entry was posted in Liddell Hart Centre for Military Archives, Military history and tagged military recruitment, parliamentary recruiting committee, propaganda, psychological manipulation, psychology, World War One, ww1 history by Lianne Smith. Bookmark the permalink.